Over the last decade or so, academic and non-academic observers have focussed mainly, if not exclusively on the institutions and places of formal power in the Greater Middle East, depicting politics in the region as a small area limited to local authoritarian rulers. In contrast, this book aims to explore the ‘hidden geographies’ of power, i.e. the political dynamics developing inside, in parallel to, and beyond institutional forums; arguing that these hidden geographies play a crucial role, both in support of and in opposition to official power. By observing less frequented spaces of power, co-option, and negotiation, and particularly by focusing on the interplay between formal and informal power, this interdisciplinary collection provides new insights in the study of the intersection between policy-making and practical political dynamics in the Greater Middle East. 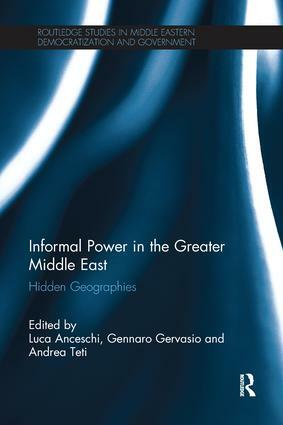 Contributing a fresh perspective to a much-discussed topic, Informal Power in the Greater Middle East will be an invaluable resource for students, scholars and those interested in the politics of the region.